Arrived back in Cape Town yesterday, checked into the Park Inn by Radisson Cape Town Foreshore for my two remaining nights in ZA, got settled and cleaned up before meeting a couple of friends for dinner. We went to a really nice Thai place, unfortunately not really up to par on the portion sizes and we had to get some starters after the main course to be satisfied. I met Eva and went for a short hike with her in 2017, yet it’s the first time her boyfriend Mike and I meet in person, good conversation and lots of fun, they’re both wonderful people and very including. Being a guide in the area, Mike points me to a route up the eastern side of table mountain and later they send me photos from one of the rare guide books describing this route. I decided to try it out, knowing that I might have to turn around if it gets too sketchy, and being totally ok with that. Starting from the hotel it takes some walking to get to the trailhead up towards Devils Peak where I started up the mountain. Hiking up to the saddle following the main trail is easy and comfortable, my main concern being to find the right fork where to turn off from the train before it’s a descent down on the other side of the saddle. Turns out it’s not that hard to find (and, yes, I mindfully chose not to point it out as the route is frankly not suited for most people) and soon I’m heading along the smaller trail up towards the table. 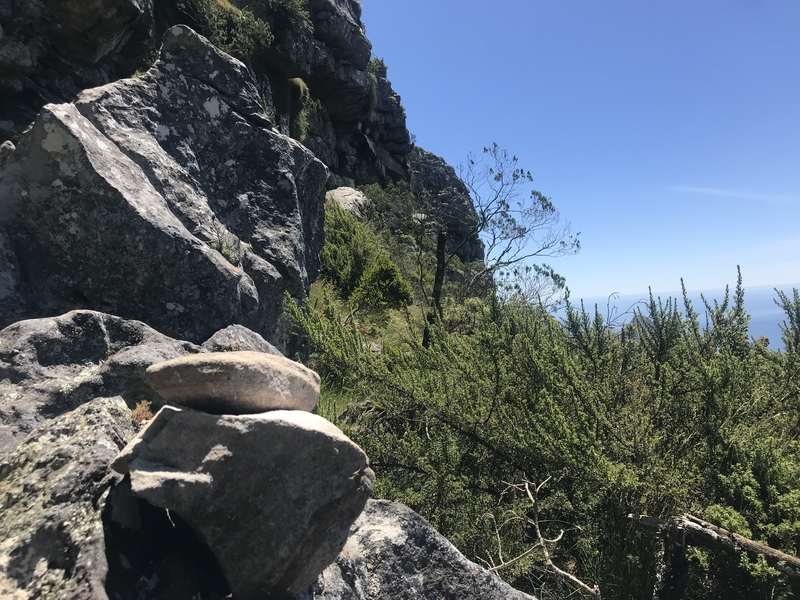 First, it’s just a faint and rather steep trail up the mountainside, yet after passing over the ledge that gave the route its name, it starts to involve some vertical climbs and becomes increasingly harder to navigate. On a few occasions, I have to double back and find the trail again after hitting a dead end. More and more climbing, at one point coming through a crack in the rock almost resembling a tunnel, I contemplated turning around a few times yet always finding a good hold for hands and feet and being able to carry on. Finally I found myself standing on a narrow ledge with a sharp drop off to the left about 100m or more (300ft) and looking at the uppermost part of a steep ravine with nowhere else to go but up, I have to admit the only thing that got me to continue was the simple fact that climbing back down seemed even more sketchy than climbing up the ravine. Obviously, I made it, though slowly and consciously, and always keeping three limbs on the rock, cautious not to slip on the wet and muddy spots and staying away from the grass and bushes barely finding grip with their roots in the superficial soil. As usual, after completing a route like this, the feeling coming out at the top is indescribable, that last stretch really got some adrenaline pumping and I enjoyed the aftermath of the rush while making my way across the table towards the station on the western side. A friendly woman at the coffee bar kindly refilled my water bag and soon I made my way down the mountain, once again following the India Venster route, that admittedly felt very timid and easy compared to the adventures coming up. Please see previous posts in referens to that route, ok? Arriving back at the hotel I had been out moving for just over seven hours and had definitely earned my dinner, and this being my last night I went for a fantabulous Prime Rib to close off an intensely fun day filled with adventures in nature! Thanks for checking out the post, please leave a comment below and let me know what You think, ok?